Brazil forward Neymar said he needed a new challenge, as he joined Paris St-Germain from Barcelona for a world record fee of 222m euros (£200m). The 25-year-old won seven major trophies in his four seasons at the Nou Camp, including the Champions League once and La Liga twice. He said his father, Neymar Sr, wanted him to stay at Barcelona. "I have won all that a player can win," said Neymar, who will earn 45m euros (£40.7m) a year on a five-year deal. Writing on Instagram, he added: "I have conquered everything an athlete can conquer. I have lived unforgettable moments. But a player [me] needs challenges. "And for the second time in my life, I'll contradict my father." Neymar's transfer smashes the previous record set when Paul Pogba returned to Manchester United from Juventus for £89m in August 2016. His £782,000-a-week wages mean PSG's total outlay is £400m. The French side have called a news conference for 12:30 BST on Friday, and Neymar will be introduced to fans at PSG's first game of the season against Amiens at Parc des Princes on Saturday. PSG reached the last eight of the Champions League last season - knocked out by a Neymar-inspired Barcelona - and were beaten to the French title by Monaco. "I feel ready to take the challenge. I will do everything I can to help my new team-mates." Analysis: What now for Barcelona? What was the moment Neymar decided to leave? 222m euros for a footballer - how do you feel? After weeks of speculation, Neymar arrived at Barcelona's training ground on Wednesday with his father and representative, and told the Spanish club he wanted to leave. La Liga believes PSG are violating Uefa's Financial Fair Play (FFP) rules and Barcelona previously said they would report PSG to European football's governing body Uefa for an FFP breach. Unable to get La Liga to take the payment, Neymar's representatives paid the 222m euros (£200m) at Barca's offices instead. FFP rules, first implemented during the 2011-12 season, stipulate European clubs cannot outspend what they earn by more than 30m euros. PSG are backed by money from Gulf state Qatar, and La Liga president Javier Tebas has accused the French club of "financial doping". It is the first time PSG - ranked the 11th most valuable club in the world by Forbes - have broken the global transfer record, with Real Madrid paying five of the past six highest fees. Reality Check: Can PSG get away with 222m euros fee? Financing, fundraising & FFP - how can PSG afford Neymar? Stepping out of Messi's shadow? Neymar's departure from Barcelona breaks up the feted attacking trident he formed with Argentina captain Lionel Messi and Uruguay forward Luis Suarez. On Wednesday, Messi posted on Instagram: "It was a great pleasure to have shared all these years with you my friend Neymar. I wish you good luck in this new stage of your life." Neymar replied: "Thank you brother. I will miss you." Then, after completing the move, the Brazilian posted his own message, calling the Argentine "the best athlete I've ever seen in my life". "Lionel Messi became my team-mate, and my friend on and off the pitch," he wrote. "I am proud to have played with you. We formed an attack with Luis Suarez that will endure forever. "I achieved everything a sportsperson can achieve. I played with these guys in video games. I lived unforgettable moments in a city that is more than a city - it's a homeland. "Barcelona and Catalonia will always be in my heart but I need a new challenge. PSG offered a bold new way forward and I'm ready. Right now I feel in my heart that it's time to go." When Neymar joined Barcelona in June 2013, the club said they paid a total of £48.6m. But after Barca refused to offer more details, an investigation was started by the Spanish prosecutor into whether the club had defrauded the treasury of unpaid tax. The president Sandro Rosell, who personally oversaw the pursuit of Neymar, eventually resigned - though he said it was for personal reasons - and his successor, Josep Maria Bartomeu, revealed the true cost of the deal was actually £71.5m. Neymar's father got £33m fee, plus £2m in "agent fees"
In 1975, Italian Giuseppe Savoldi became football's first £1m player with his move from Bologna to Napoli. And Britain followed suit four years later, when Nottingham Forest paid Birmingham City £1.2m for England forward Trevor Francis. Maradona moved from Boca Juniors to Barcelona for £3m in 1982, before joining Napoli two years later for £5m. Ronaldo joined Barcelona for £13.2m in 1996, but left after just one season to join Inter for £19.5m. Brazil winger Denilson (£21.5m), Italy striker Christian Vieri (£32m), Argentina forward Hernan Crespo (£35.5m), Portugal winger Luis Figo (£37m) and France playmaker Zinedine Zidane (£46m) all raised the bar over the next three years. Brazil midfielder Kaka (£56m) breached the £50m barrier in 2009 before his new club Real Madrid broke the record again by signing Portugal forward Cristiano Ronaldo from Manchester United for £80m three weeks later. The Bernabeu club beat their own record again with their £85m deal with Tottenham for Wales forward Gareth Bale in 2013 - before Manchester United paid £89m for France midfielder Pogba last summer. News: What can I buy for one Neymar? Manchester United manager Jose Mourinho: "Expensive are the ones who get into a certain level without a certain quality. 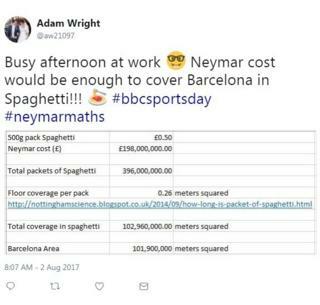 For £200m, I don't think [Neymar] is expensive. "I think he's expensive in the fact that now you are going to have more players at £100m, you are going have more players at £80m and more players at £60m. And I think that's the problem. Liverpool manager Jurgen Klopp: "I thought Fair Play was made so that situations like that can't happen. That's more of a suggestion than a real rule." Lille director general Marc Ingla, a former Barcelona vice president: "It's a blow for Barcelona. Neymar is an accelerator to this bright future of Ligue 1. The young talent pool we have here is the best in Europe. For sure we can still compete with PSG. Once you get on the pitch it's 11 v 11 and all the transfer fees and salaries narrow a bit." Barcelona's Arda Turan: "It was a great pleasure to have lived all those unforgettable moments with you my brother. Wish you the best. Always..."
What would 222m euros buy you? Rêvons Plus Grand! ", PSG's motto, is hard to avoid at their stadium, Parc de Princes. Signing Neymar, and obliterating the transfer world record, is certainly living up to that self-imposed ideal. The club's owners, Qatari Sports Investment (QSI), are the upstarts within the European game and are determined to disrupt the old order. QSI is an arm of Qatar's sovereign wealth fund - so PSG's ambitions are backed by the enormous natural gas wealth of the Gulf state. Qatar is locked in a bitter dispute with its Arab neighbours right now - so this transfer has a distinct political overtone as it seeks to show it will not be diminished or cowed by an on-going trade blockade and a diplomatic war of words. Having secured the World Cup in 2022, PSG is seen in Doha as one of the ways through which the state can achieve its ambitions. And in Neymar they now have a player it hopes can bridge the gap between Champions League wannabes and serial winners. Progress towards that target has not been easy so far. Millions spent in transfer fees has delivered plenty of domestic silverware. It is not the success the club truly craves. A spate of recent quarter-final defeats and last season's second-leg capitulation to Barcelona in the round of 16 does not reflect the high ambitions of those in charge. The talk in Paris is of building a dynasty, not merely creating fleeting moments of hope and glory. As for Uefa's financial fair play? The regulations have certainly tempered PSG's elaborate spending in recent seasons but Neymar's arrival represents a serious challenge to the club in this respect alongside Uefa's credibility. The value of this deal - fee and wages - must pass the necessary tests. There's confidence within PSG's boardroom that it will not be a significant issue but their accountants will perhaps be as busy as the first team squad in coming months. In the end, this is an era-defining transfer on a par - in terms of its significance - with Maradona to Napoli, Shearer to Newcastle, Zidane, Ronaldo and Bale to Real Madrid or Pogba to Manchester United. Those moves all had sporting ambition at their heart. This transfer, for now, is perceived more as a triumph of political and financial considerations. But this is football. And ultimately this deal will not be judged in the governmental salons of Doha nor on a spreadsheet. Instead, success must be delivered through PSG capturing the club game's greatest trophy. Brazilian journalist Fernando Duarte: "This is simply the biggest ever deal in football history. "We're talking about a player who has the potential to be one of the best in the world. He has the marketing potential, he's a natural, unlike Lionel Messi for example who always looks awkward on camera. "Why should Brad Pitt get $20m for a movie and a football player, who is not going to be playing in his 40s like many sporting stars, shouldn't? "One year before the World Cup, he's going to a club where everything will be resting on his shoulders. If PSG win the Champions League, it will be Neymar's plaudits. If PSG fail, it will be Neymar's fault." Reality Check: Can PSG get away with fee for Neymar? Read more on Reality Check: Can PSG get away with fee for Neymar? The moment that sparked Neymar’s 222m euros exit? Read more on Neymar: Was this the moment PSG target decided to leave Barcelona? What team could you buy for a Neymar? What can I buy for one Neymar? Read more on What can I buy for the price of one Neymar?